Durastill 42 Gallons per Day, Automatic Water Distiller with 150 Gallon Reserve tank. Commercial applications unlimited! A giant in the distiller industry. Designed to connect to a demand pump providing distilled water "on tap" throughout a building. Proven to be very dependable over the years. 240 Volt, 20 Amp standard, (208 Volt, 24 Amp also available.) Made in USA. All of our best features for the commercial user! Commercial Distiller with 150 gallon storage tank - produces 159 liters (approximately 42 gallons) every 24 hours. *Optional Automatic Drain Valve available. Made in the USA by Durastill, the recognized leader in water distillation systems for over 35 years. 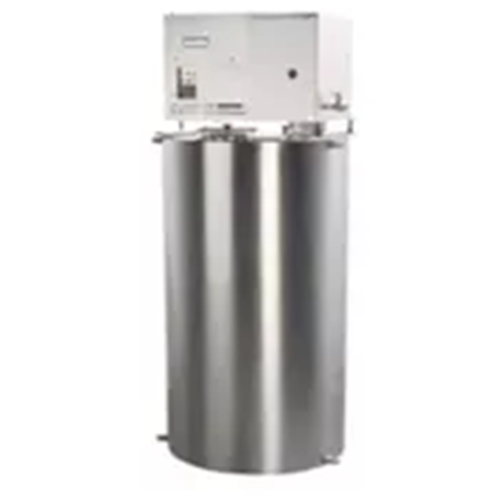 *The Automatic Drain Valve option is highly recommended to help keep the boiling chamber clean. These systems are not difficult to install, but feel free to call us should you have any questions during installation. You have your choice of 208 Volt or 240 Volt depending on what you have available and prefer. (If you already have 208 Volt service, that would probably be your choice. If you do not have 208 Volt service already, then 240 Volt is normally standard. All Durastill Distillation Systems come with everything needed for a normal installation. But additional water line, distribution faucets, fittings and other parts are available from us or from your local plumbing outlet. We also offer the “Remote Faucet System” that has the demand pump already integrated with it, along with filter, pulsation eliminator tank, faucet, line and fittings, etc. These make for a more organized installation and might be worth the small added cost. (For more information on the Automatic Drain Valve, Remote Faucet System, Demand Pumps and other parts and accessories click Durastill Parts & Supplies category in left menu).